Many thousands of years ago, Lancashire’s coast line was 50 to 60 feet higher than it is today and geological research proves the existence of submarine forests. This land covered with oak, birch, fir and ash must have been the stamping ground of wild boar and wolf. Amongst the sandbanks we now see off Fleetwood and the Fylde Coast, roots and trunks of trees have been found. There is little evidence of Neolithic times but sparse settlements of Celtic races and visits from the ‘Northmen’ or Scandinavian raiders occurred. On the opposite bank of the River Wyre, facing what became Fleetwood-on-Wyre, Northman Haakon set up his longhouse which came down to us as Hackensall Hall. Possibly the Romans were here. A road typical of their making was found beneath sand when Fleetwood’s sea wall was made. Some believe that this road connected the ancient harbour of Portus Setantiorum at the mouth of the Wyre. Known as Danes Pad and passing through Fylde villages towards Poulton and Kirkham, alongside it have been unearthed spears, axes, coins, urns and a shield boss, the latter now in the British Museum. The land on which Fleetwood stands belonged to the wapentake or hundred of Amounderness mentioned in William the Conqueror’s Domesday Book of 1086. Three pages of Latin abbreviations and strange yet recognisable spellings tell that the region was sparsely populated, laid waste and the property of baron Roger de Poictou, his share in the spoils as one of William’s mercenaries at the Battle of Hastings. He was later banished and Amounderness given to Theobald Walter, another Norman and founder of Cockersand Abbey, across the river from Fleetwood. Over the centuries, the land passed to the Crown but Henry VIII sold it in the course of the dissolution of the monasteries. Edmund Fleetwood was the first of the name to reside at Rossall Hall as lord of the manor but it was his descendant Peter Hesketh who put Fleetwood on the map. Interestingly, it was another descendant who, with others, signed King Charles I’s death warrant. He was called General George Fleetwood. In the 1830s Peter Hesketh’s Rossall estate was a desolate tract, home of thousands of rabbits and sea birds. A line of marram-grass clad dunes culminating in the Mount of today disappeared, for the sea continually encroached. Extensive flooding occurred in 1833 when cattle and horses were drowned and outbuildings at Rossall Hall were damaged. However, Peter, lord of the manor, High Sheriff of the County of Lancashire (later to be knighted and change his name to Sir Peter Hesketh Fleetwood) had good reasons for believing that the site held the makings of a busy sea port and popular resort. A river mouth, a natural sheltered harbour (‘safe as Wyre Water’ passed into the folklore), golden sands, sea, air like wine and breath-taking views across Morecambe Bay on clear days. All that lacked was a railway from busy Preston. In the face of deep personal sadness and heavy financial loss he determined to make Fleetwood a success. A single line railway from Preston opened on 15th July, 1840, following the formation of the Preston and Wyre Railway, Harbour and Dock Company. In the meantime, houses, hotels and wharf had been built. 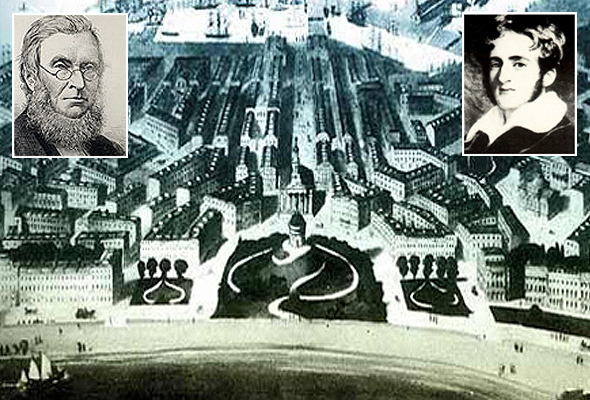 It was essentially a planned town, unlike others flung up during the Industrial Revolution. A famous architect and friend of Peter’s (as was Queen Victoria), Decimus Burton had wide thoroughfares marked out by plough, radiating from the Mount which was grassed over. Originally Starr Hill, the highest in the chain of dunes, it became a focal point. A summer house was placed on top from which Esau Carter Monk, one of the first town commissioners, dispensed refreshments. The North Euston Hotel and the lovely Regency houses on Queen’s Terrace were part of the brave design. (To discover where Sir Decimus Burton took a house, consult the Fleetwood Town Trail). As the new town grew with houses, shops, church, school and boarding houses visitors crowded in for sea-bathing, scenery, sands and dancing in the Mount hollow. Trips for workers’ regattas were planned. Wealthy visitors stayed on Upper Queen’s Terrace from three weeks to three months. Breakfast at the North Euston was two shillings, a bedroom four shillings a day. During Whitsuntide Week of 1844 thousands of tripper travelled on the half fares offered by the railway company. Figures topped 60,000, the largest Sunday School trip in 1846 carrying 4,200 in 56 carriages pulled by 2 engines. These were boom years, but a branch line to Blackpool later persuaded large numbers away from Fleetwood. Peter’s unscrupulous agent, Frederick Kemp, also contributed to his failing fortune. Although never a declared bankrupt, that was to be the fate of his only surviving child Louis, Peter had expended so much of a large fortune he had to lease out and later sell Rossall Hall. The sale of goods lasted a fortnight. He went abroad and later settled in Brighton. Control was rested in the township. Improvement Acts for starting the famous market, for paving, lighting and cleansing were passed. Isle of Man sailings were extended, steamers travelled to Londonderry, Belfast and Ardrossan. A fleet of fishing smacks built up the town’s reputation for hake catches. Fleetwood became the third largest fishing port in the country. Two lighthouses and the fearless reputation of its lifeboat men made news in many a fierce storm. In a short history, important events have to be omitted but the visit of Queen Victoria in 1847 made headlines in the Illustrated London News showing the sweep of Queen’s Terrace and much of Burton’s architecture as backdrop for the crinolines. The Dock, costing £250,000, was opened in 1877, the sea defences completed in 1962. The worst flood occurred in 1927 when six people died. In 1933 Fleetwood became a Borough and with attractions and amenities increasing, it rates high for a healthy family holiday. Hostage of the Cod Wars, commercial fishing has inevitably declined but an indefinable, raw quality, a sense of history is floated in the oyster catchers’ calls as the tide ebbs. The pioneering thoughts of Sir Peter or the anxious thoughts going out to trawler men on winter seas in their dangerous calling? A nostalgic compounding of many things, Fleetwood-on-Wyre remains a fascinating place with a great past and hopefully a great future.